As the whole herd does not walk along the race at once, there can be uneven wear on an AMS farm. Areas close to the dairy and AMS can get soiled easily and will likely require more frequent maintenance. Ensure they are wide enough to make maintenance an easy task. Position gateways at the end of the paddock closest to the dairy as this is easier for cows to exit without assistance. Do not limit cows' access to water. Ideally it should be available at multiple locations on the farm. It is not necessary to have water in each paddock. However, depending on distance it may be in laneways, at the dairy, in the paddock - or all three. 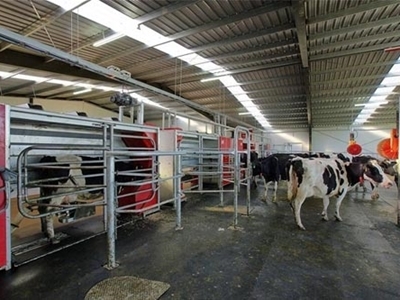 There are two main considerations when designing the dairy: cow flow and people comfort. Both are important for an efficient operation. Talk to the suppliers for different options. How do I manage my pasture when automatic milking? Successful automatic milking goes hand in hand with excellent pasture management, which is good news given New Zealand’s pastoral farming systems. This is because voluntary cow movement is largely determined by pasture availability. Looking at post-grazing residuals, along with production and milking frequency data available from the management software, provides a key gauge of feeding level, ensuring pasture harvested is maximised. To achieve a >70% utilisation rate with approximately 80-90 cows per milking station, without extended cow waiting times, requires good control of cow traffic. This is achieved using drafting units or selection gates, positioned either in the dairy or along the raceways remote from the dairy, which automatically allow targeted cows to enter a new grazing area, be returned to older pasture or sent to the dairy for milking. Typically two or three new areas of pasture are available to the herd daily, with one of these occurring near midnight to ensure the milking stations are kept busy during the early morning hours. Do I need to change my grazing system? The simple answer is no! 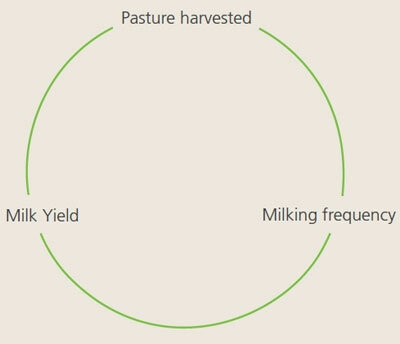 Profitable operation of pastoral dairy systems is based on the correct feed allowance per cow that will result in optimal/profitable feed conversion efficiency per cow and hectare. Research indicates this is in the vicinity of 80 – 90kg LWT/t DM. Grazing systems have been developed to utilise pasture efficiently and allocate feed to the herd in a manner that balances cow production and profit. There are grazing ‘tools’ in use that enhance this (e.g. pre-graze mowing, returning cows to a grazed area until the desired residual is achieved), and pastoral AMS utilises many of the same ‘tools’ but with a few extras. But you will need to change the grazing method. Within a batch milked system control over access to grazing (duration, area, mass, herd size), and milking frequency (herd scale twice a day, once a day (or combinations within the herd) are directly imposed in the day-to-day operation of the farm. By contrast automatic milking relies on voluntary cow movement from the grazing area to the AMS. Control of the operational running of the farm is then a shared function between farm staff and the cows themselves. It is important that rotational grazing is balanced to induce cow movement. To achieve this at least two and preferably three allocations of fresh pasture (or other feed) are offered each day. How does it work for all pasture systems? Many people believe that all grass dairy systems cannot work with voluntary milking. DairyNZ research has shown that with appropriate cow traffic systems in place 24h milking can be achieved with just 2.5% of the diet concentrate fed through the AMS and over 13 T/ha DM can be harvested from the farm. As pasture residual levels increase the cows will reduce voluntary movement and therefore milk less frequently with the flow on affect in reduced yield. This creates a reduced feed demand, which in turn will result in higher residual mass level. The direction of this cycle is critical for pastoral AMS. What if the feed balance changes? A flexible approach to manual cow movement has a positive affect especially during periods when pasture supply exceeds demand. Typically, cows remaining in a grazed area would be manually moved from that break twice daily. Adopting a flexible approach to the timing of these manual moves can allow for greater control over post-grazing residuals and therefore intakes. There are other flow-on benefits in terms of increasing milking frequency and AMS utilisation. The timing of manual moves is determined by cow traffic patterns, paddock location, time of day and grazing residual. Voluntary milking systems are reliant on motivation within the system for cow movement. 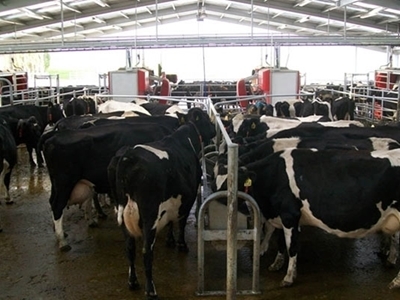 Milking robots have a feed bin at the front of the stall in which meal can be dispensed. The introduction of imported feed requires no labour input as the feed is allocated to the cow as she is milking. As the feed allocation at the AMS increases so does the motivation to ‘visit’ the AMS. The 1-5 system definitions used by DairyNZ are based on the feed imported, and a system that is totally reliant on pasture, as the feed supply, will require efficient pasture management skills. DairyNZ research has demonstrated that the system is effective with 97.5% of the diet from pasture. As the quantity of imported feed increases the emphasis shifts from intense grazing management to ration balancing skills. In essence the same factors that are applied to a conventional system when increasing the feed input (i.e. importing feed) will apply to an AMS. With the exception that the infrastructure required is reduced (i.e. feeding concentrates ‘in bail’ is an existing facility).